Because life should be delicious, make this for yourself. 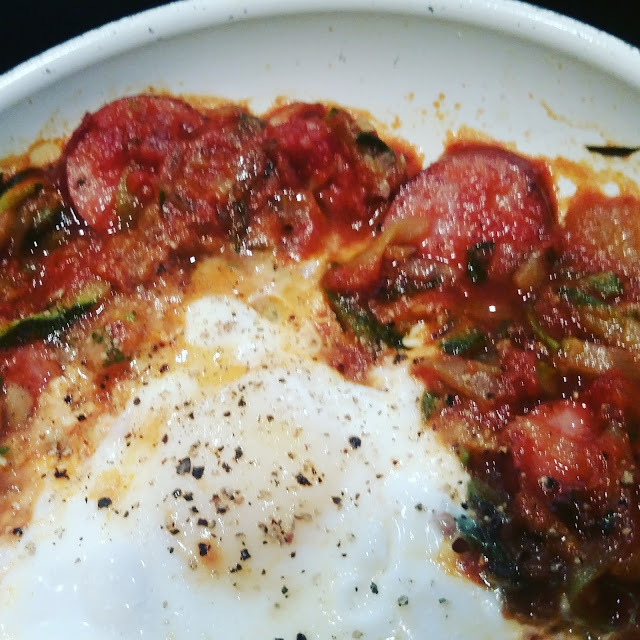 My take on Eggs In Purgatory that repurposes leftovers. Its a breakfast, lunch, or dinner sort of meal that brings warmth and comfort to the depths of the soul. The rich yolked egg is nestled in the tangle of zucchini and sausage smothered in the flavorful caramelized onion and tomato sauce. Sheer scrumptiousness. I made Zoodles With Sauce for supper last night. This particular time I used nitrate-free smoked turkey sausage cut into fat little coins instead of ground chicken or turkey. It was yummy. I was really looking forward to the leftovers. This morning I put a generous helping of the leftovers into a small egg skillet. I let it all heat through and come to a bubble. The zucchini noodles softened. I made a little indentation in the middle and cracked an egg in letting it run through the zucchini and sausage. I seasoned the egg with salt and pepper then covered the pan and let the egg cook through. I only let mine go for a few minutes so that the white was completely cooked and the yolk was still runny and glossy. I slipped the whole concoction from the pan straight onto my plate and dug in with gusto. If I wasn't on a grain free kick I would have had a big hunk of crusty baguette to dip with. But this was even good as a stand alone. ***In a pinch, if you don't have these same leftovers to start with, then simply use your favorite jarred marinara or any other leftover tomato sauce as the cooking base for a tasty variation (top the whole thing with parmesan shavings for extra delight). Utilize whatever you might have on hand.